This quilt was made without an initial design plan. 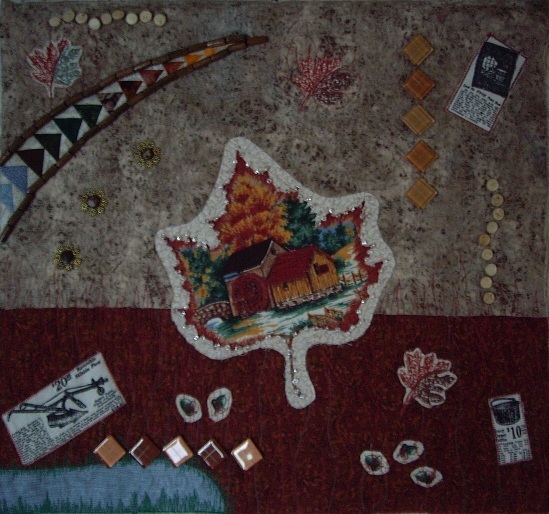 I started with the big maple leaf in the centre, and choosing two fabrics that would be suitable for the background. I then added a backing and batting, but thought the batting made it too fluffy, so I ironed the three layers until the batting was compressed. After that I continued to add fabrics, beads and other embellishments until I thought the quilt looked finished. I satin stitched the quilt around the perimeter to finish.